Delivering much more out-of-the-box functionality than other systems, Kentico makes enterprise-grade, integrated marketing manageable and affordable for businesses of all sizes. Replacing laborious coding with easy configuration of rock-solid technology, Kentico simplifies and speeds the creation of stunning websites and the management of sophisticated customer experiences. Kentico drives value for customers and partners by delivering actionable data that improves productivity, builds brand affinity, and drives successful campaigns that generate higher conversion rates and increases profits. Through a series of videos and shows, Kentico will show you market insights and give you the information and knowledge needed to accelerate your business to success. See six real-life examples of successfully winning a higher number of satisfied customers on the highly competitive and global market. 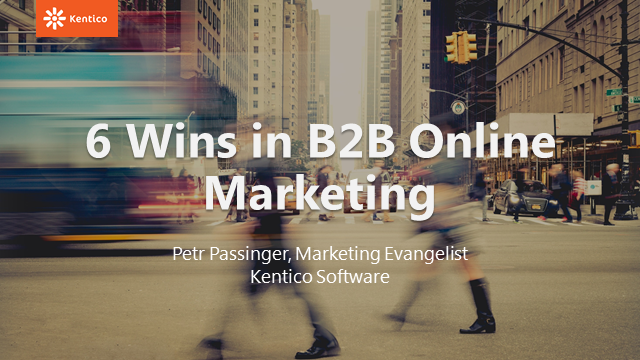 The webinar will be led by Kentico’s Petr Passinger; who will offer the right mix of sales and marketing information from his first role in Customer Care, through Marketing Manager, and finally Sales Operation Leader with Kentico. 7 minutes to learn everything you need to know about marketing automation. Learn what marketing automation is and how you can use it in practice. Make your online marketing and sales more efficient by setting up automated process to interact with your website visitors, leads and customers. You can easily design your own Marketing Automation processes using the drag&drop visual workflow designer to manage all your lead nurturing and customer engagement activities for better customer satisfaction. Using marketing automation together with content personalization allows you to not only automate a great user experience, but to make it personal to each of your website visitors. Try Kentico EMS now or schedule a 1-on-1 demo for free at http://www.kentico.com. 4 minutes to learn everything you need to know about lead scoring. With lead scoring software you can easily identify your hottest leads that require immediate action from your Sales team, those not yet ready to buy but could benefit from further nurturing, and those not interested that should be abandoned for the time being, so as not to waste your time or resources. Qualify your leads to increase the efficiency of your sales team, shorten sales cycles and increase revenue. Try Kentico EMS lead scoring software now or schedule a 1-on-1 demo for free at http://www.kentico.com.